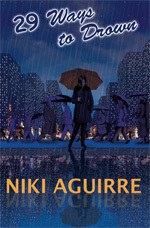 29 Ways to Drown, is the debut of Niki Aguirre, a stunningly talented Ecuadorean-American writer. Influenced by a Latin-American literary tradition steeped in magic realism, but embracing a personal history that includes sojourns in Chicago, Cadiz, Guayaquil and London, Niki's fiction conveys a gritty world with a haze of surrealism. Niki Aguirre was born in the US to Ecuadorian parents. She spent her childhood between Chicago and Guayaquil, and studied English Literature at University of Illinois. Her short stories have appeared in anthologies introduced by Sarah Waters, Julia Bell and Tash Aw, as well as in PEN International Magazine. “Philosophical but gritty, magic but very certainly real, these stories deal with themes of time and memory across various setting from London to Ecuador.” – Julia Bell, author of Massive and Dirty Work. Really good read, and a real boost for anyone who aspires to write short stories. Great read! Once I opened it, I couldn't put it down.